Nylon monofilament line in top condition helped to secure this excellent bag of 4-6lb (1.8-2.7kg) codling. Every winter, as the water gradually cools down, large shoals of this fish move inshore. Dacron and wire can also be used for Never use wire line for fast- many boat fishing situations. If, for running fish such as porbeagle or example, you are shark fishing in tope because you must keep deep water with a weak tide, you can tension on wire line at all times so use 30-50lb (14-23kg) ordinary or the line doesn’t coil or kink and, as lead core Dacron line. a result possibly break. Some of the different types of sea lines. From top to bottom: braided nylon (60lb/27kg), braided nylon (20lb/9kg), Dacron lead core trolling (45lb/20kg), monofilament (120lb/54kg), monofilament (25 lb/11kg) and wire (30lb/14kg). Modern technology has developed a wide variety of lines to meet almost every sea angling need. Anglers have never been better served. Braided Dacron leaded trolling line is excellent for shark fishing. Its weight helps it get the bait to where you want it. 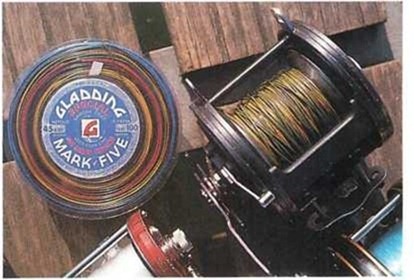 This reel is loaded with multi-strand wire line, a good choice for fishing on the sea bed when the tide is fierce – for example when cod fishing off the Isle of Wight. This angler is playing a big cod off the Eddystone Reef (near Plymouth) and trying to maintain his balance as the boat dances on the rough sea. 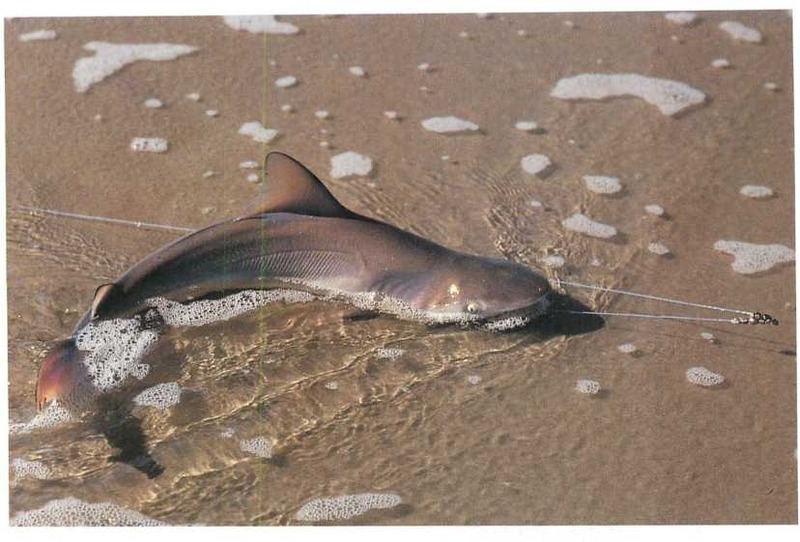 A small tope is brought to the shore. In most shore fishing sessions, use 20- 30 lb (9-14kg) mono for your traces – regardless of how small the fish might be – to help prevent tangles. Alan Yates closely monitors his line and rod tip for a possible bite. Monofilament line should be properly maintained – wash thoroughly after each fishing session and watch for fraying, especially after fishing rocky venues. Three widely used lines for sea fishing are mono, Dacron and wire. Phill Williams looks at the advantages and disadvantages of each. 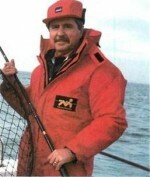 M any sea anglers over-emphasize the role of terminal tackle (such as traces which come in direct contact with the fish) and the reel, neglecting the link between these two – the line. No tackle is stronger, both in terms of hooking and holding fish, than its weakest link. Selecting the appropriate line and breaking strain depends on where you are fishing and on the species you want to catch. This is by far the most popular choice among anglers, and with good reason. Monofilament is cheap; it casts the farthest of the three; and it can be used in general fishing situations in depths up to 60m (200ft) with weak tides. Mono’s inherent stretch doesn’t present a problem in shallow water. 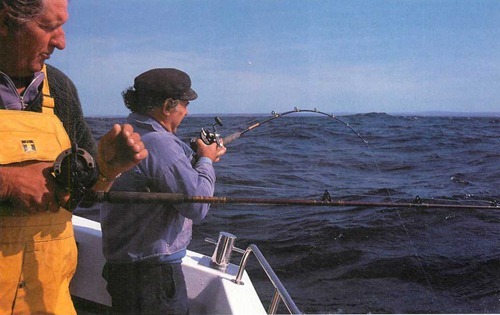 However, when fishing in deep water with strong tides, you can sometimes miss bites because the stretch in the line may absorb them. Even if the bites do register, the stretch absorbs your strike, and setting the hook then becomes the problem. You have to strike unbelievably hard. There are times, however, when stretch can be a good thing – if you strike too hard in shallow water or fight a powerful fish when the drag is set too tightly or when the rod is too stiff. Even though it has many good points, mono has poor knot strength. 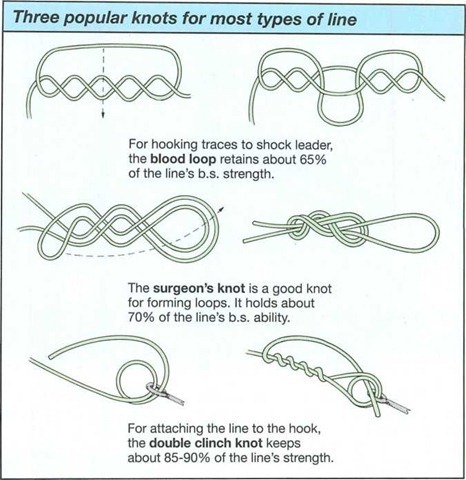 Many inexperienced anglers, who don’t know how to tie good knots well, lose up to 50% of the line’s breaking strain. Anglers too often fail to maintain their line properly. 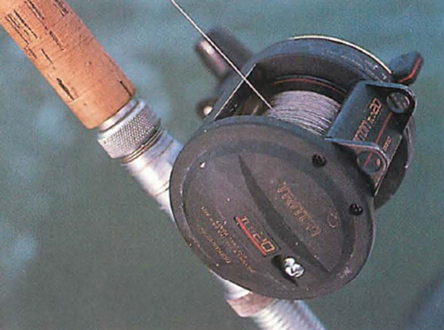 After each fishing session, check the line for signs of fraying and rinse your reel in fresh water. In hot summer weather you should take extra care of your line. Ultraviolet rays in sunlight can weaken monofilament line considerably. In fact, leaving line sitting in the sunlight for a week can reduce its breaking strain by about 50%. 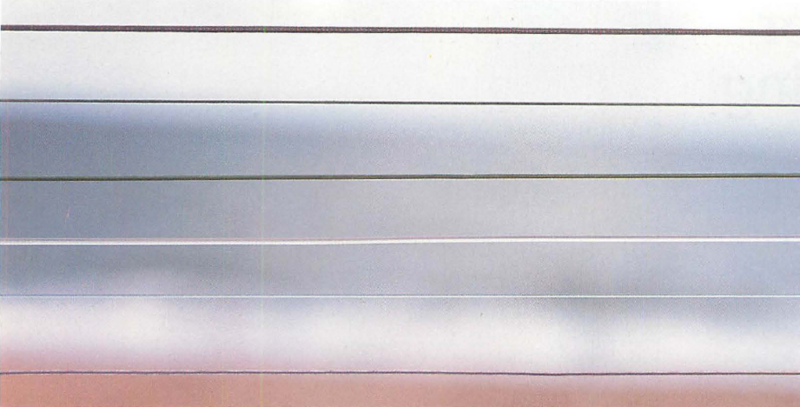 Line baking in hot cars also loses much of its strength. Two signs of deterioration are discolouring andbrittleness. Dacron, made from polyester fibre, was heralded as the way forward for boat anglers, particularly those interested in line class records. Many of the problems associated with mono can be avoided with Dacron. Unlike mono, it doesn’t stretch – this is excellent for bite detection and for hooking fish, and it provides maximum sport. You can feel the fish’s movements much better than with mono – for example, catching a small fish feels as if you’ve hooked a giant. Dacron’s knot strength is also superb. Dacron has its drawbacks, however. For instance, its knotting strength is so good that a small tangle can mean getting the knife out and cutting the line to sort things out, wasting time and money. In the relationship of its diameter to its breaking strain, Dacron is the thickest of the three. So when there’s a strong tide, you need a lot of weight to hold bottom. Also, it doesn’t cast as far as mono. If the tide is not too strong and the water is deep, Dacron is excellent for trolling or shark fishing under a float on the drift. Wire lines are for boat fishing only. There are two types – multi-strand and single strand. Multi-strand is far superior in that it doesn’t kink, but single strand wire can be twisted as a means of ‘knotting’; multi-strand needs to be crimped rather than tied. Wire fishing lines share all the favourable characteristics of Dacron in terms of bite detection, positive striking and getting the most sport out of a hooked fish. But the best thing about wire is that it offers the smallest diameter in relation to breaking strain compared with the others. Wire should be your first choice if you have to contend with a fierce tide which rips along the sea bed. Since it’s so thin, it easily cuts through the strongest of tides with a minimum amount of weight. It can be used in many boat fishing circumstances, but it should never be cast (such as in uptide fishing) because it’s too stiff and coils easily, forming tangles. 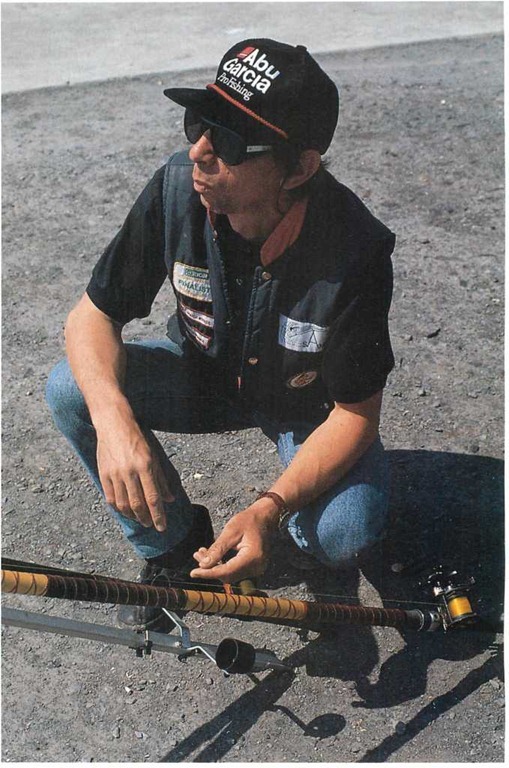 Keeping tension on the line at all times helps to reduce coils and kinks. A disadvantage of wire is that you may need multiplier reels with metal spools and rods which have at least one end roller (though having rollers throughout the entire rod length is recommended). Standard rod rings become grooved because the wire continually presses against them. Never use your hands to try to free snagged fine – wire (like mono for that matter) cuts like a knife. It’s a good idea to use a trace with a slightly lower breaking strain, in case you snag the bottom. Over the years it has become clear which of the three lines anglers prefer for most fishing situations – nylon monofilament. 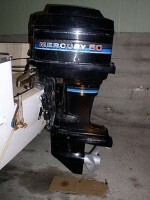 It’s the best all-rounder for boat and shore fishing. Dacron is mainly limited to boat fishing (especially trolling) and short range casting, and wire is for boat fishing only in deep water with strong tides.